New Gin Delivery Page | Salcombe Distilling Co.
SUMMER 2018 SEES THE LAUNCH OF OUR GIN BUTLER SERVICE AND THE RETURN OF OUR UNIQUE GIN DELIVERY SERVICE TO VISITING YACHTS IN THE SOUTH WEST. Both services can be ordered by calling the Salcombe Gin Distillery on 01548 288180 followed by option 1 for the distillery, or via VHF channel 71 (call sign Salcombe Gin). 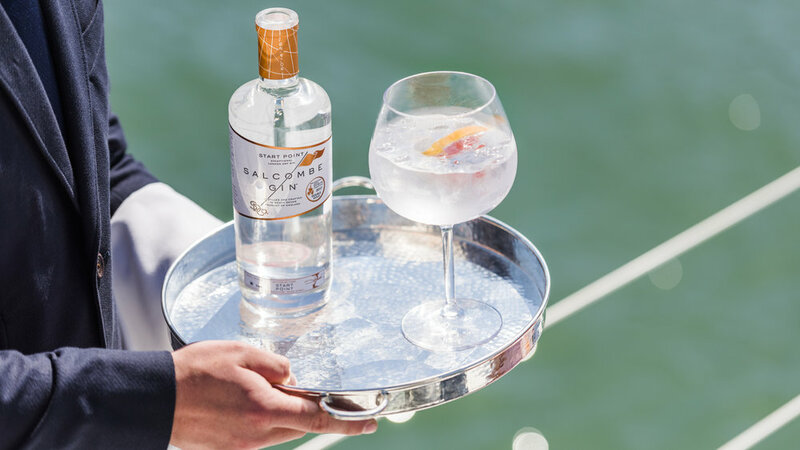 Our Salcombe Gin Butlers can be reserved to board your yacht for the ultimate 'pennant hour'*, preparing signature Salcombe Gin cocktails and providing exquisite liquid refreshment for you and your guests on board. Arriving in style on our customed Ribeye powerboats, our Gin Butlers will provide you with the perfect sundowner gin experience on board. This service is available for yachts in the Salcombe area and can also be booked for properties located in Salcombe and the surrounding area. *Historically gin pennant flags were raised by naval captains to invite officers from nearby sailing vessels on board for drinks; consequently junior officers would often compete to raise the gin pennant aboard other ships and thereafter arrive demanding refreshment! Those that wish to create their own 'Salcombe & Tonic' on board, can order a stylish Salcombe Gin hamper to be delivered to their yacht.